Sony A7SM2 With The Camera Error Problem. This article pertains to the camera system error telling you to turn power off then on with your Sony A7, A7S, A7R, A9, A6000, A6300, and A6500 series cameras as well as any other Sony mirrorless camera models. 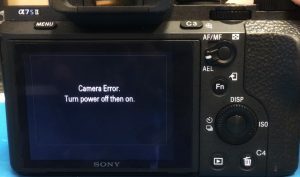 From a technician’s point of view I wanted to write this article to give you some insight as to what this system error means and what to do if you get the camera error message telling you to turn power off and then on with your Sony mirrorless camera. These camera errors can occur due to multiple types of failures with your Sony camera. The most common reason that your Sony camera will go into error is due to the shutter. For cameras that have the IBIS system, (in body image stabilization) which includes the Sony Camera’s A72, A73, A7S2, A7R2, A7R3, A9, and the A6500; We have also seen these cameras having errors caused by the sensor stabilization or IBIS not functioning properly. And lastly electronic circuit problems will also cause the camera error telling you to turn power off and then on. Once again, you will typically see this camera error occurring right at start up. What kind of accidents? Dropping or impact; water, liquid, or moisture damage. We also see these problems occurring when you connect the camera to an incorrect power source that could cause damage to the internal circuits of the camera. When getting your Sony camera repaired, it is important to note what happened to it prior to having this problem. I have a few suggestions of what you could do when your Sony camera gives you a system error message before sending it in for repair. One thing to note: When the system error message “Camera Error Turn Power Off Then On” comes up, you will see that your camera may be locked up. This means when you turn the power switch off the camera will stay on showing the error message. The only way to power down the camera is to turn the power switch to the off position and remove the battery or disconnect the power source. The Shutter and IBIS are mechanical assemblies that when subjected to impact could cause them to become misaligned, damaged, or stuck. When you turn the camera off then on both the shutter and IBIS go through a reset or initialization process. When you power cycle (turn power off disconnect power then reconnect power and turn on) the camera if everything comes back up and you don’t see an error message, I recommend keeping an extra close eye on the camera and it’s operation to insure it is operating normally. If after power cycling the camera the error message is still showing up, another thing you can try doing if possible is resetting the camera. This is done in the settings tab of the menu. Note: If you power the camera back on and it freezes up you may not be able to access the menu to reset the camera. If turning the camera off then on initially works but later you continue to have problems, the camera will need to be sent in to be looked at. If you are having problems with your camera DO NOT try to “fix” your camera by hitting or banging it around. There are very sensitive components inside your Sony Alpha camera and you will most likely make matters worse. We disassemble the camera, test, and diagnose the problem that is occurring. We also have special software that aids us in this diagnoses. Once an estimate is approved we will repair or replace the defective or worn parts. We do all the necessary cleaning and servicing as well as any alignments and calibrations that are needed to ensure everything is functioning 100%. Fill out the Repair Order Form and ship the camera to us for a free estimate. If you have any questions before sending your camera in for repair we welcome your call. Talk to one of our experienced Sony camera technicians 888-283-2228. You can also visit our Sony Alpha Camera Repair page.